This is a great dish for dinner parties because you can prepare the fish in advance and leave it aside or in the fridge until you’re ready to cook it. The quantities below are based on making one salmon fillet per person, so just multiply it based on how many packages you need to make. On your square of silver foil, lay your piece of smoked salmon onto the foil and place the fresh salmon fillet on top of the smoked salmon. 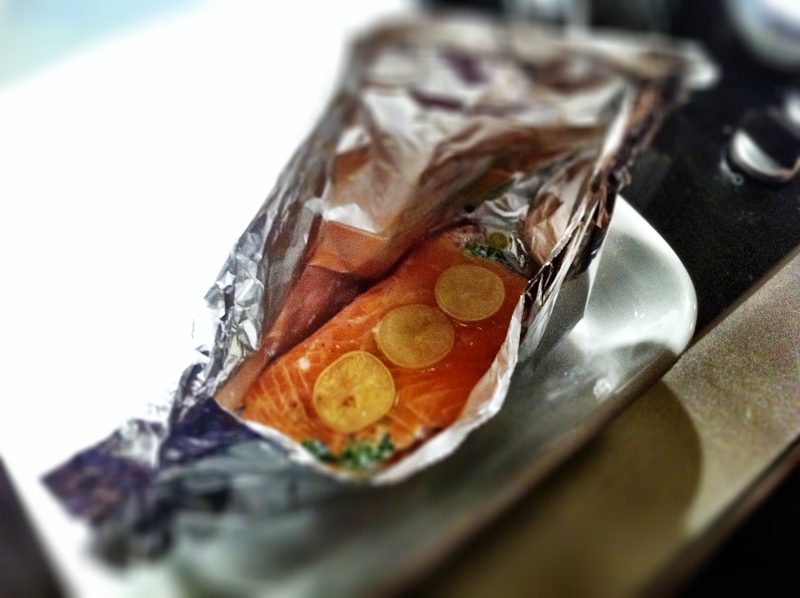 Squeeze lemon juice all over the fillet and smoked salmon. Sprinkle a dash of herb seasoned salt over your salmon fillet and some black pepper. Then top your salmon fillet with the chives. Pour the creme fraiche over the salmon fillet and then wrap the smoked salmon fillet over your fillet and tuck the ends under the fillet so you end up with a little salmon parcel. Drizzle some olive oil over the salmon with a pinch more black pepper. Lay your slices of pickled lemon on the top and then seal up your salmon package, making sure it’s wrapped up properly and isn’t leaking. To cook, bake in the oven at 180 degrees for 15 minutes then turn your oven down to 160 degrees and bake for another 10 minutes. We had ours with grilled courgettes and some plain boiled rice. Bon appetit!